Form and Function’s second release comes from the hand of A. Brehme. Over the years, the Brussels based artist has built a solid reputation as a DJ through frequent appearances and curating his own nights at Fuse Club in Brussels. This is in addition to being a co-resident with Peter Van Hoesen at Technoon and playing in clubs such as De School, Grelle Forelle, Suicide Circus and more. 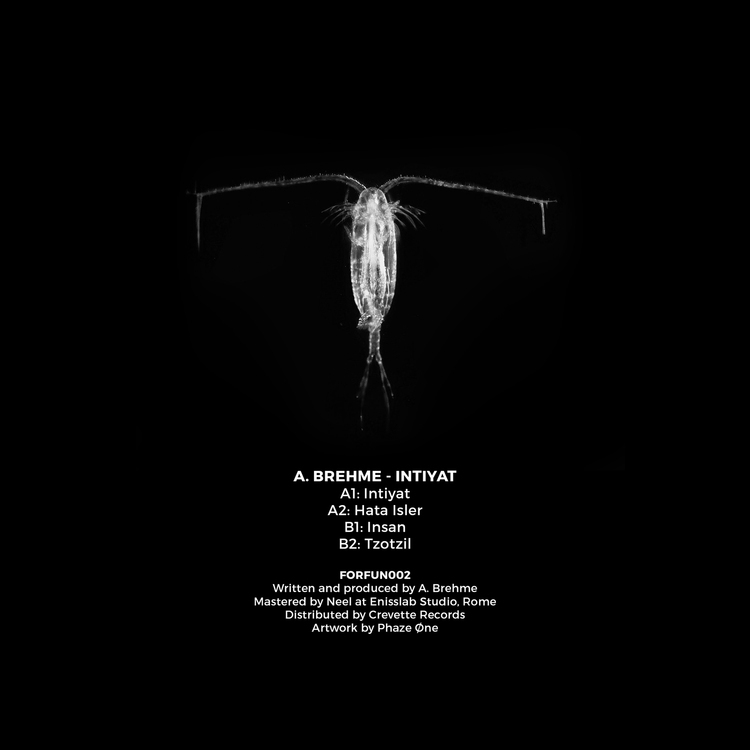 After years of silent but devoted work in the studio A. Brehme is ready to release his debut EP consisting of four powerful cuts that perfectly reflect the sound and mindset he gained his reputation with. On the A-side things start off with “Intiyat”, which simply can be seen as a distorted form of “Initiation”. Starting off hypnotic, the track slowly progresses adding a plethora of subtle percussive elements. A mysterious chanting complements the latter throughout the sonic voyage and caters for a promising start. Part two of the A-side, “Hata Isler”, takes off where “Intiyat” ended, but amplified in strength. Subliminal voices manipulated harmoniously into the pads are mixed with sophisticated alternations of snares and hats. The result: a perfect continuation of the first track’s spirit. Side B commences with “Insan”, a title that serves the track right. It’s straight forward, upgrading the tempo of the previous tracks into a drive that’s impossible to resist. The maelstrom of drones and soundscapes on a layer of thundering sounds induce a new stage of sonic hypnosis, until it gradually phases out into silence. “Tzotzil” on the other hand is a skillfully crafted tool track that’s built around a glooming and reverberating bassline.